Early in 2012 I reviewed Nozbe and Zendone, two browser–based task management apps that are steeped in David Allen’s Getting Things Done® (GTD®) methodology. Since that time, both apps have continued to improve. Nozbe has added new functionality and overhauled the user interface of its suite of apps. Just today they rolled out version 1.8. Zendone, which was still in beta at the time of my first review, has gone gold, produced apps for the iPhone and Android and added significant new functionality and polish to what was already an excellent tool. Nozbe and Zendone are very similar. They are both developed by software developers with a clear commitment to GTD® and to ongoing quality improvement. They lead the field in terms of integration with Evernote. For what it is worth, I have tested 28 task management apps over the past two years and Nozbe and Zendone both figure in my virtual ‘top–five’. This is a gentle review therefore, a comparison of two very capable tools. Some of that information will have been superseded, as Nozbe is now up to version 1.8 and Zendone up to version 1.0.3 (build 611). a counter (in project, next actions and context view) shows the number of active tasks and total estimated time for that page view. This is particularly useful in the ‘next action’ view: how can you fit an estimated 14 hours of work into an eight–hour working day? extensive training material available in five languages. value for money: the premium version of Zendone costs $50 per year (compared to $96 for Nozbe). The free version provides full functionality but imposes limits on Evernote and calendar synchronisation. 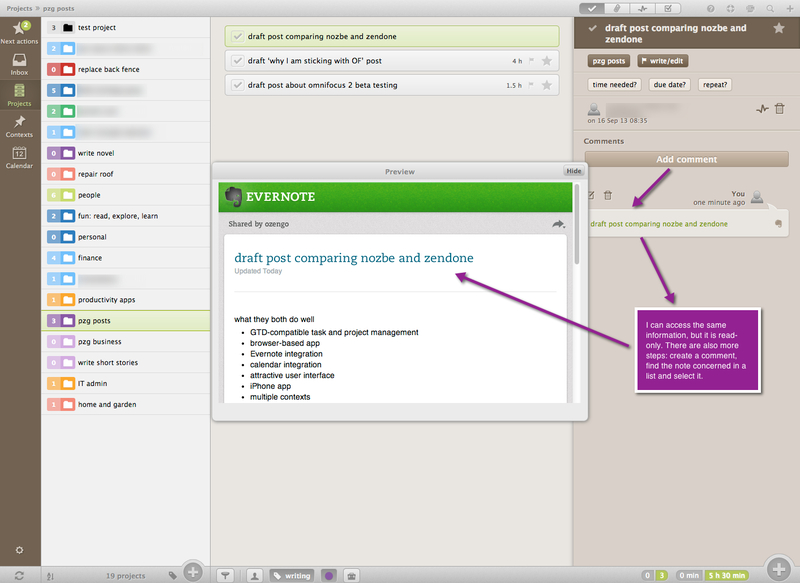 Evernote integration in Nozbe (version 1.7). Nozbe version 1.8 lets you create a task from a note displayed in the ‘attachments’ view. The presence of a clearly visible note attached to a task can spur you into action. I often jot down some points to address in an email and before I know it I have drafted the entire reply. This has happened in both Nozbe and Zendone. Any feature that reduces the threshold between a task and its completion needs to be cherished. Pagico and IQTELL allow you to import your contacts. Whether any of the above features is sufficient reason to explore one of those apps further will depend upon your needs and preferences. Either Nozbe or Zendone will provide you with a solid task and project management app based on GTD® methodology. If you are thinking of a team–wide solution, Nozbe is probably the better choice because of its team collaboration functionality, its rich array of features and its capacity to upload files and link to Dropbox. Zendone, however, also appeals because of its elegance and simplicity, its superior integration with Evernote and its better value for money. Even so, while I really enjoy using Zendone, I have never embraced it as my personal task manager because of the lack of subtasks and a native iPad app. If you are a mac user looking for the ultimate productivity solution I would, at this stage, still recommend Omnifocus because of its unparalleled functionality and its excellent mobile apps. Thank you for taking the time to read this post. This entry was posted in productivity and tagged calendar integration, evernote integration, GTD, nozbe, omnifocus, productivity, to do app, zendone by Gilbert Van Hoeydonck. Bookmark the permalink. Great article – thanks for reviewing these apps! For a future review, could you please review IQTell (coming out if beta soon) as it solves a major problem for most of us…integrated email inside the app. It’s not as advanced as Nozbe/Zendone (I’ve used both) but it makes processing email and Evernote much easier and faster. Thanks again for your great site! Interesting to hear your feedback Shels as I am a fan of both IQTell and Zendone but left ZD after frustrations in the user interface. I even paid for the whole year and still moved to IQTell because it eliminates several of “middleman” apps like email, calendar, Evernote and to some extent contacts/addresses. Even though Zendone is better looking, IQTell is more “usable” in the sense that all the information I need is in one place and customizable. I do like Nirvanahq as well but will be staying with IQTell for the foreseeable future because of the convenience of all my information together when I need it. Thanks for your comment Shels! Email integration and processing are the most compelling features of IQTELL but I personally don’t feel ‘at home’ in their project view. I won’t be doing a side-by-side comparison of IQTELL and ZD though there will be a comparison of sorts as both will figure in a post on my ‘top 10’ productivity apps that I am currently working on. Cheers! nirvanahq is my opinion has the best replication of GTD around. Hey Michael/Zen – I agree with you both re the IQTell interface – it could really do with a good refresh by a web designer who blends functionality with attractive visual design. Although I guess as it’s form-based, there might always be a bit of a stark, excel spreadsheet-type look about it. Ozengo – thanks again for the great articles. Look fwd to your new post! i like zendone much better than nozbe. i a lot of it could be the ui,but i just dont like nozbe much. tried it and it didnt take. zendone i loved from the first time i saw it. im a log time remember the milk user about to switch to either zendone or facile things. i am also a heavy evernote user. anyone have any thoughts or opinions between zendone and facile things? I too liked Zendone better than Nozbe, preferring how it looked and how it interfaced with Evernote. Everyone has different requirements for their GTD solutions…I needed Mac and iOS apps at minimum. I started to have problems with Zendone in the project and tasks views…it became really frustrating to work with as the amount of screen clutter from all of my projects could not be neatly sorted, hidden or dragged around. The Zendone iPhone app was another frustration as tasks/projects were not as easy to manage. I eventually settled on Todoist for their cross platform solution (I use a Mac, PC, iPhone, iPad) depending when and where I am working. Todoist is very good at handling tasks and projects and looks good. I thought that I would have trouble without Evernote integration but found that I just need a good task and project manager (primarily) and can use Evernote for a repository solution. I like the thoughtfulness of your work. Do ThinkingRock and/or GTDOA fit in this discussion? How would they compare to Zendone? Thanks. I’ve tried IqTell, Zendone, Wunderlist, RTM and Nozbe (and considered quite a few more). 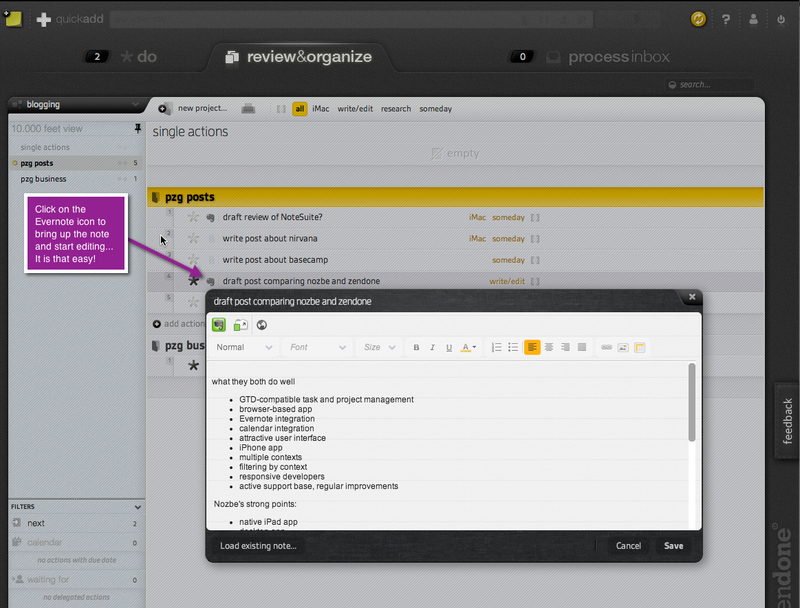 Almost every product provides reasonable GTD tools to stay organized and get things done. But I needed more than Wunderlist could provide. I need a way to collect many different types of actions (from pictures, web-pages, notes, etc.) as well as providing supporting/detail information to the actions themselves (the supporting data could also come from any combination of webpages, notes, pictures, PDFs, Word and Excel files). This is where Zendone’s 2-way Evernote integration really shines. It extends the GTD action functionality by providing an extremely easy to use and rapid way to add any type of item for processing, from simple filling of meeting notes, to complex task management. Since I can forward the specific emails I want to take action on to my Evernote account (using emailing into Evernote), which are automatically added to my list for processing, I don’t really need (nor want) gmail integration. Zendone appears to be in active development and has an engaged community. I think this bodes well that the product will be continually improved based on end-user feedback. I’m very happy with my choice of Zendone and have recommended it to a few co-workers, all of whom have started using it with positive results as well.